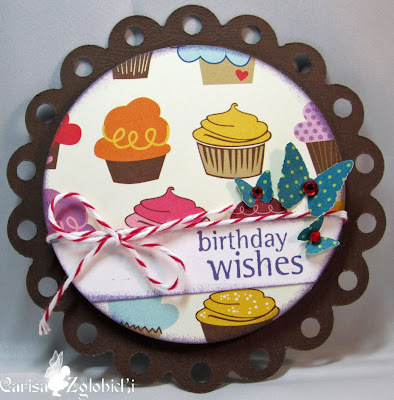 Inky Fairy Designs: GIU - Birthday Celebration Continues! Hi everyone, so sorry I'm late! I was working on completing 80 baby announcements for a friend and didn't have projects lined up for this week either! Ah, procrastination gets me again. hehe BUT, I did manage to pick up some new goodies so I got to use those for my cards! I made two mini cards (also working double duty for this weeks ippity challenge & new release challenge). 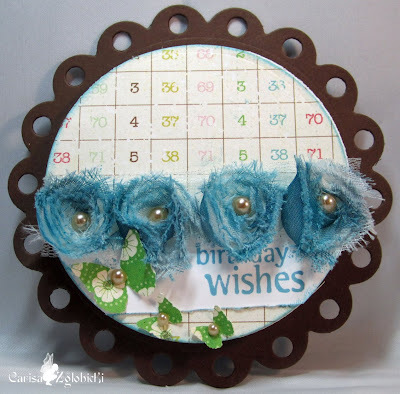 I just LOVE these eyelet circle nesties and used them to frame my mini circle cards. I thought these would be great on top of presents. :) Very fast & simple to make. I loved it. The birthday wishes sentiment comes from my favorite ippity set Just Wanted To Say. My new goodies are the eyelet nesties, the Tim Holtz trim which I distressed with Broken China and Weathered Wood distress inks and the MS butterfly punch that I've had on my wish list forever! Thanks again for stopping by & be sure to leave a comment to win! I'll be back tomorrow with my last GIU post and then I'll pick a random winner on Sat after I get back from my copic certification class out of all my GIU posts this week! Okay, first? EYELET CIRCLE SCALLOPED NESTIES?? I might DIE!!! Second, how freakin CUTE ARE THESE!!! So cute, Carissa, love these little guys! They are adorable! I love the new nesties!! A few on my wish list!! Love how cute both your cards turned out!! Love the flowers on your first card!! These are so cute! I love the holed scallop circle! Looks great with the trims and sentiment! these are sooo super cute! I love the mini size! OMG that is TIM HOLTZ trim? your cards are beautiful-and I am GAGA over those gorgeous flowers! GREAT job w/ the distress inks, wow! Fabulous cards! LOVE those nesties and that trim is rockin! Nice job.